Home Rubbers -Pimples Dr Neubauer Super Block - back by popular demand! 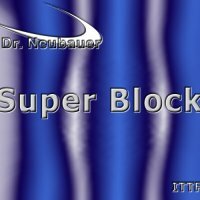 We hereby state explicitly that 'SUPER BLOCK' is no longer ITTF-approved since 01 July 2008 and therefore cannot be used for any official match. However the rubber may of course be used for leisure and for practice.